Last night, Nintendo and Square Enix delighted Final Fantasy fans by announcing a whole bunch of new Switch ports. There’s Final Fantasy VII, Final Fantasy IX, Final Fantasy X/X-2, Final Fantasy XII, and even the adorable pocket edition of Final Fantasy XV. But where’s Final Fantasy VIII? It’s not clear why the adventures of Squall and Rinoa haven’t made the cut, but for some reason, Square Enix has left FFVIII out of all its recent re-releases, which are now coming to both Switch and Xbox One. On PS4, you can buy ports of the PlayStation versions of Final Fantasy VII and Final Fantasy IX, as well as HD remakes of X and XII, but you can’t get VIII. Similarly, both FFVII and FFIX are out for smartphones, but there’s no FFVIII in sight. FFVIII is available on PS3 and PSP, and you can snag the old PC version on Steam, but as Square ports its games to new platforms, Final Fantasy VIII has been ignored. It’s not clear why. This doesn’t really make sense. (I asked Square why it’s skipping FFVIII, but haven’t heard back yet.) It’s not like Final Fantasy VIII is some reviled piece of history that the company should pretend never happened, like Final Fantasy IV: The After Years. The pivot to realism and hard sci-fi might have been offputting back when the game came out, in 1999, but today it just feels like part of an eclectic RPG series that deserves to be preserved. When I revisited Final Fantasy VIII as part of my Final Fantasy retrospective—which, I swear, will be back before the world comes to an end—I found that it was actually quite enjoyable, and that the story holds up pretty well. 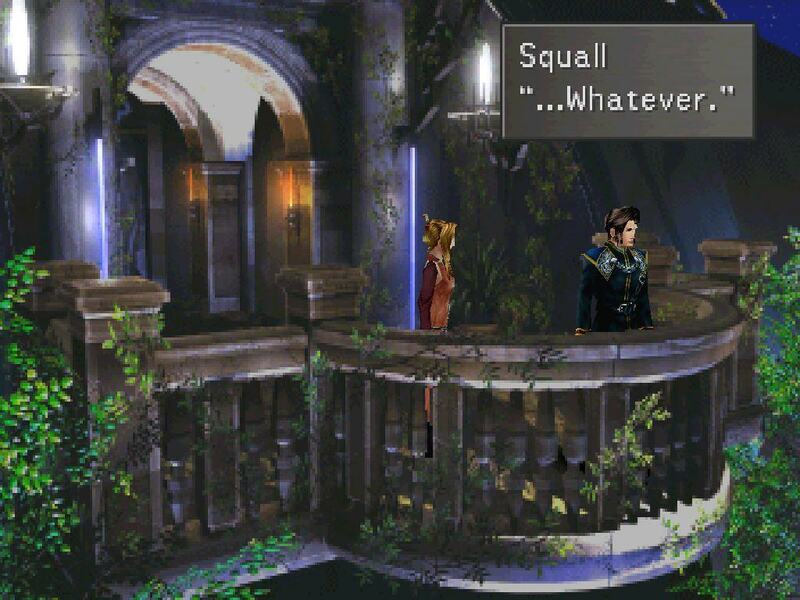 Let’s ask Squall what he thinks of this weird snub. Squall, what do you think?